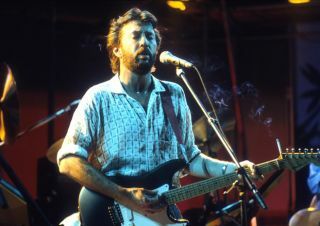 When it comes to spontaneous, improvised phrasing, there is perhaps no better blues-rock guitarist than Eric Clapton. Learn how to play in 6/8 from our new columnist, Julian Lage! Learning slide guitar in standard tuning allows you to focus on fret-hand touch and pick-hand articulation without having to re-learn the fretboard and chord forms in an alternate tuning. Watching Molly Tuttle switch effortlessly between rhythm comping and high-velocity single-note lead lines is like listening to at least two guitarists at once. Believe it or not, you’ve probably already played one or two shapes of this chord. A few examples from the rock and pop catalog of how famous composers have successfully harnessed this enigmatic chord to great effect. Learn a mode-based application of some of Jason Richardson's top six-string arpeggio exercises. John Petrucci demonstrates “the Horse” whinny made famous by Eddie Van Halen, "the Satch method" and more helpful whammy bar tricks. Craft some truly epic solos with the harmonic minor scale and phrygian-dominant mode. Some simple shred ideas that are perfect for players who are dipping their toes into the style for the first time. Learn how to put all the scale theories, chord theories and playing techniques you know together into a coherent musical picture. 20 licks designed to teach you how to play authentic country guitar. Examine the envelope-pushing sounds of some of the essential prog-rock bands of the Sixties/early Seventies era. Get an inside look at the mechanical magic of his arpeggio picking technique. Lindsey Buckingham Teaches Fleetwood Mac's "Landslide"
Lindsey Buckingham teaches you how to play "Landslide," and goes in-depth on his picking style. Learn three of Brian Setzer's most ferocious riffs. Learn some cool ways to create angular single-note arpeggios that are based on root-fifth-octave power chord shapes. Take the most common pentatonic positions and string them together to create ripping-fast riffs and runs. Learn how to not just pick up guitar solos, but really nail them down. Steve Howe Lesson: How to Play Yes' "Starship Trooper," "Siberian Khatru" and "Mood for a Day"
Steve Howe shows you how to play the key riffs to several Yes classics.